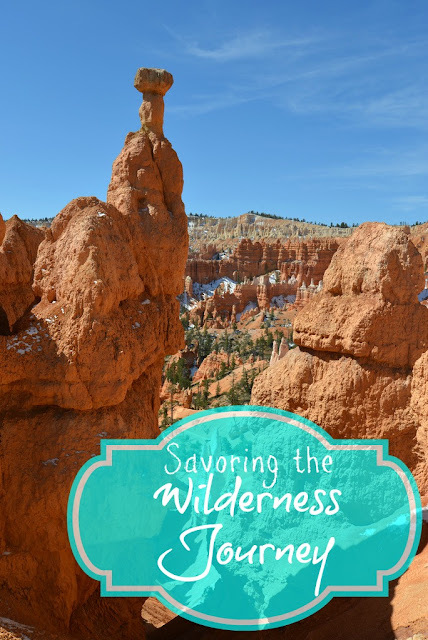 You are reading Savoring The Wilderness Journey, posted by Heather Mac, originally posted at Joyful Socks Mom blog. *This post may contain affiliate links. Please see our full statement of disclosure here. Thank you for your support. I have joked for many years that the LORD must really trust me for giving me kids that each have completely different learning styles. One auditory learner. One kinesthetic learner. One visual learner. Now, let's mix in some more fun ... Dyslexia. OCD. Asperger's. Educating all three of our children has proved to be the single best "sanctifying" factor in my life. Humbling. Merciful. Painful. Illuminating. Exhausting. Worth-Every-Second. Each one of my children learns differently than the others, and that's okay. The learning differences present in our home appear to be one of the daily factors in my life that keeps me humbly on my knees asking for help & direction. If you had asked me at the beginning of this learning differences journey, weather I wanted to walk down this road or not, of course, I would have respectfully declined. None of us in our right minds typically seek out life's struggles and difficult lessons. Now that I am at the verging ends of the learning differences journey I can now say that I would not trade this life experience for anything in the world. You see, God throughout the history of His people allowed struggle to refine them. To change them, for His glory, into the likeness He intends for them to individually become. Refined by fires of struggle and the chipping away of those things that we all desperately hold on to, but do not need. What appears from the outside to be too great a burden in our lives is actually Christ's merciful hand, bringing us to a place of surrender. Coming to the edge of myself, means coming to surrender. This is the place where we can begin to fully trust. Abiding. This is the place where faith becomes active. "The person who has no trials and no difficulties is the person whom God does not dare allow Satan to touch because this person could not stand temptation." "There have no temptation taken you but such as is common to man: but God is faithful, who will not suffer you to be tempted above that you are able; but will with the temptation also make a way to escape, that you may be able to bear it." Count it all joy that God has a plan for you and your children, and He trusts you with the weight of it. Count it all joy that He is strengthening your faith and your family through whatever refining fire He so chooses. Count it all joy that you are now, and always, in the hands of the faithful, mighty and merciful God. Count it all joy that He has provided you a means to rest in Him and trust Him in the plan He has set before you. "My brethren, count it all joy when you fall into divers temptations; knowing this, that the trying of your faith worketh patience." In God's good time, struggling learners too, will blossom to fulfill His purpose. Count it all joy that the Lord has brought us to a place where we do not limit Him in unbelief because of our struggling circumstances, but in believing now know He can do exceedingly and abundantly more. He is beyond our fathoming. He is that amazing. He is that good. "And Mary said, behold the handmaid of the Lord; be it unto me according to thy word." Let this be our faith. Faith that reaches heaven. Faith given by Christ, that moves us to total and complete alignment with God's word and his perfect plan ... even if His plan includes a learning differences journey. 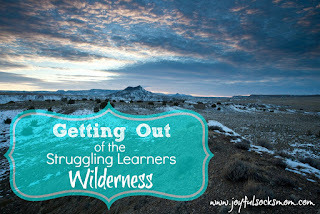 The final stop on our journey in Getting Out of the Struggling Learners Wilderness is the not-so-simple task of abiding. Abiding requires every stop we've already made on this journey plus on additional amount of active faith. Abiding on this journey is a process of daily trust, not any one single act of bravery or courage. Abiding means trusting God daily with the good and the not-so-good days. It means that we daily choose to walk in faith whatever path Christ has laid before us. As we choose to trust Him in all things, even in the struggle to learn with our children there begins to emerge blessed moments to see His loving hands, His tender mercies and we can begin to give Him glory. I really believe abiding means that we truly believe and trust in God's divine purpose and plan, regardless of the surrounding circumstances. We must purpose in our own hearts and minds to trust where He has us walking right now, and choose to forthrightly walk wherever that path may lead with joy. Yep ... JOY! There it is ... the choice. We do have a choice in how we walk this life. I hope you will choose to trust the One who has set your path. I hope you will abide in the peace & comfort He stands so able and willing to give. Homeschool Mom Winter Summit - No other homeschooling event is quite like this refreshing, encouraging, vision-restoring weekend for homeschool moms! See you at Summit!